What a better way to celebrate Nigerian Independence Day with your children than with books? Books provide children with window and mirrors to the world around them. Growing up, the dominant representation of Sierra Leone in American media involved war, famine, and disease. Luckily, my experiences traveling there and the stories my sister and parents shared countered what I saw on TV. However, as a child, there were not many children’s books that reflected the positive representation of contemporary African cultures, identities, and life. Thankfully, children literature has come a long way, and while we still have some ways to grow in this area, I am excited to use Nigerian Independence Day as a time to celebrate Nigerian culture and their contributions to the world, while inspiring our young readers. These five picture books, inspire young children to love and take pride in Nigeria! Your family will love this beautifully illustrated story of little Anya as she learns about Nigerian culture. It includes references to Nollywood, fashion and music! Award winning author, Nnedi Okorafor takes a dive into children’s literature with this special tale of a cheeky chicken who attempts to ruin the New Yam Festival! Thankfully, young Anyaugo is awake to save the day. 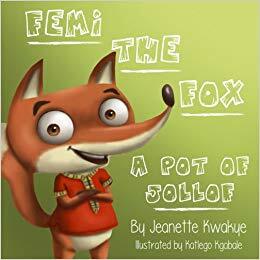 Olympian Jeanette Kwakye pens this lovely story about a fox named Femi who is on the hunt for a delicious pot of jollof. But along the way he learns a very important lesson. This story is actually a follow-up to a mobile language app for teaching Nigerian languages. If you are trying to build your child’s Yourba language skills this appropriately titled book, follows Ade as he uses different Yoruba greetings throughout his busy day. Perhaps there is no universal coming-of-age experience for a young boy like his first haircut. This is lovely peek into Ife’s first haircut narrated from his sister’s perspective. What makes this story really fun its use of colorful photographs which will definitely connect with young readers.